Hockley Golf Club is a private members’ Club established in 1914 with a deserved reputation for providing some of the best year-round playing conditions in the South of England. Hockley is a James Braid designed golf course set on 240 acres of historic chalk downland overlooking the City of Winchester. Interestingly, although the first impression is of a hilly course, it is in fact the least hilly of all of the local courses. The course starts with a gentle climb up the first four holes, then is flat for most of the rest of the round, losing all of the height that has been gained down the 18th hole – which is the view that you see. Our course flows naturally through the landscape. It has great views, stretching as far as the Isle of Wight on a clear day. Hockley Golf Club welcomes societies and corporate groups throughout the year. We can guarantee your group a great day out. A wide choice of menu, excellent facilities and a top quality chalk downland course ensure everyone has a memorable day. Our clubhouse and pro shop staff are on hand to assist and look after your every need. 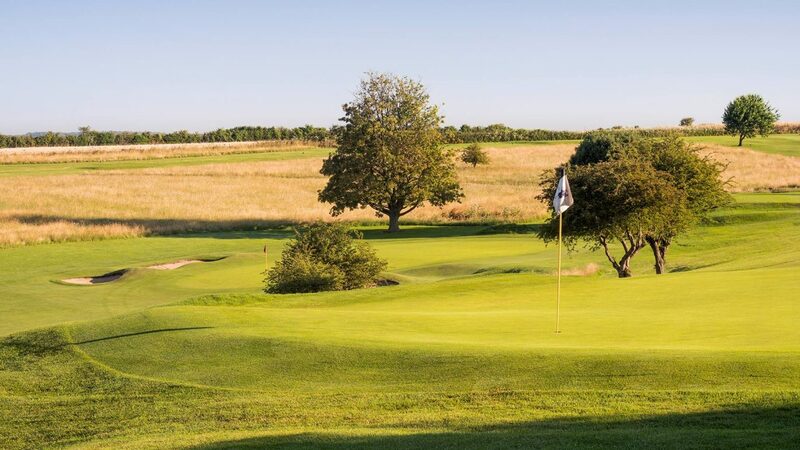 It is considered enjoyable for both high and low handicap golfers alike and when the breeze is up Hockley is a great challenge. Excellent society packages from £50 per person includes Coffee on arrival, 18 holes of Golf followed by a first class meal. Within easy reach of Junction 11 of the M3. Mon - Fri £52. Weekends after 2:00pm £60. Practice range, driving range, 3 warm up nets and ample car parking.